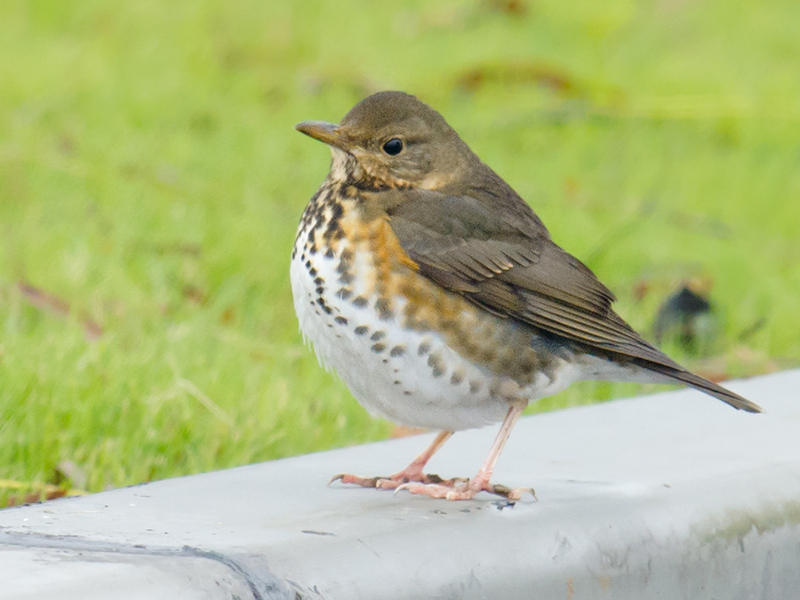 We searched in vain for White’s Thrush, and we found only 1 Grey-backed Thrush. Among our 9 Pale Thrush was one completely tamed by the photographers, whose latest innovation is to spear mealworms on a thin, stiff wire and induce the Daurian Redstart to hover to reach them. 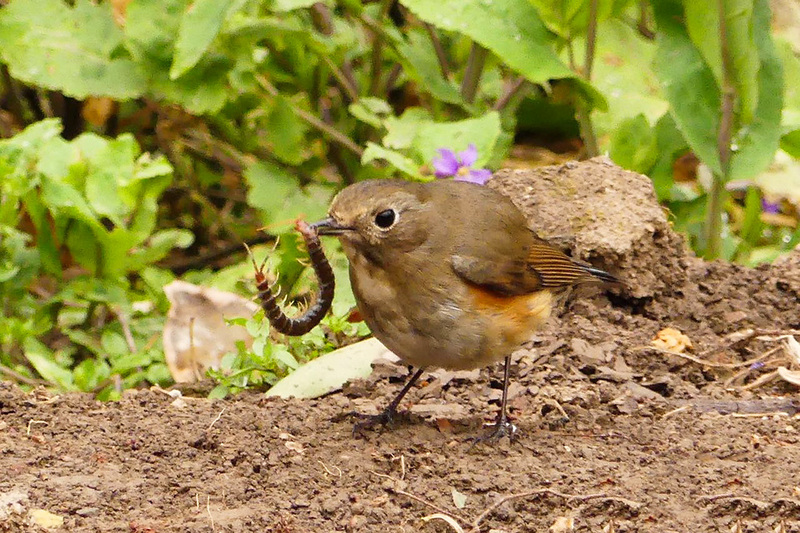 The redstart was uninjured by this tactic, which is an ethical step up from fastening mealworms with tiny, ingestible nails (as I have previously found Shanghai-area photographers doing). The photographers were chasing the Pale Thrush off, but so hooked was the thrush on the free protein that it refused to go away and made occasional dives at the baited wire. Elsewhere, we heard in this most urban of settings the same “tseep, tseep” contact call that Pale Thrush make in the much wilder country near Elaine’s hometown in Heilongjiang—Pale Thrush breeding ground. On Fri. 5 Feb. and Mon. 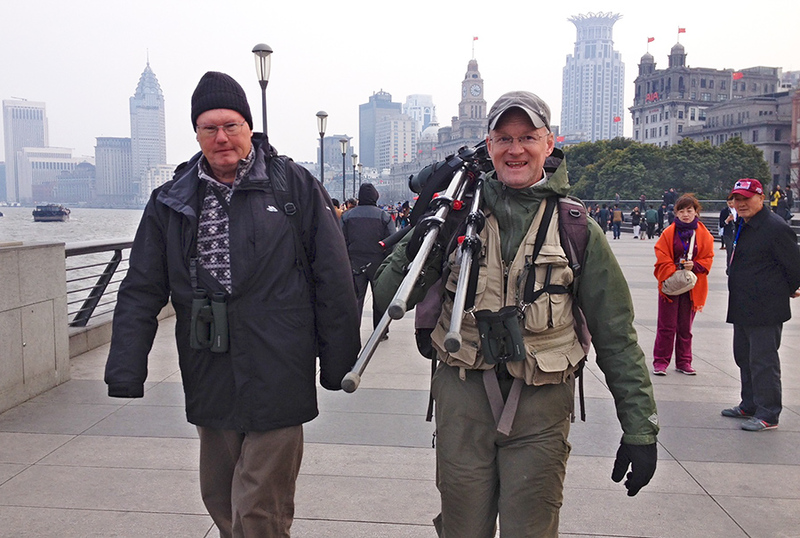 8 Feb., Elaine Du, Kai Pflug, and I noted 64 species on a two-day “Nanhui on Foot” tour. Horned Grebe, Black-necked Grebe, and Greater Scaup maintained their presence on Dishui Lake, and on Friday we picked out a single Black-faced Spoonbill among the Eurasian Spoonbill. On Monday we noted Water/Brown-cheeked Rail, saw a flock of 240 Kentish Plover and 900 Dunlin, and enjoyed an early morning moment with four bunting species (mainly Pallas’s Reed Bunting and Little Bunting with cameos by Chestnut-eared Bunting and Black-faced Bunting). We struggled to ID our Pallas’s Reed Bunting to ssp. level. Were the mysterious lydiae mixed in? The interval of 72 hours between Friday and Monday saw changes to the composition of birds on Dishui Lake. Counts of Falcated Duck went from 230 on Friday to 0 on Monday. Horned Grebe and Greater Scaup also fell off our Monday list. Numbers of Tufted Duck, meanwhile, increased from 22 to 140. Common Pochard saw a jump from 0 on Friday to 300 on Monday, but they were found on the pond behind the Magic Parking Lot, which we were unable to check Friday. 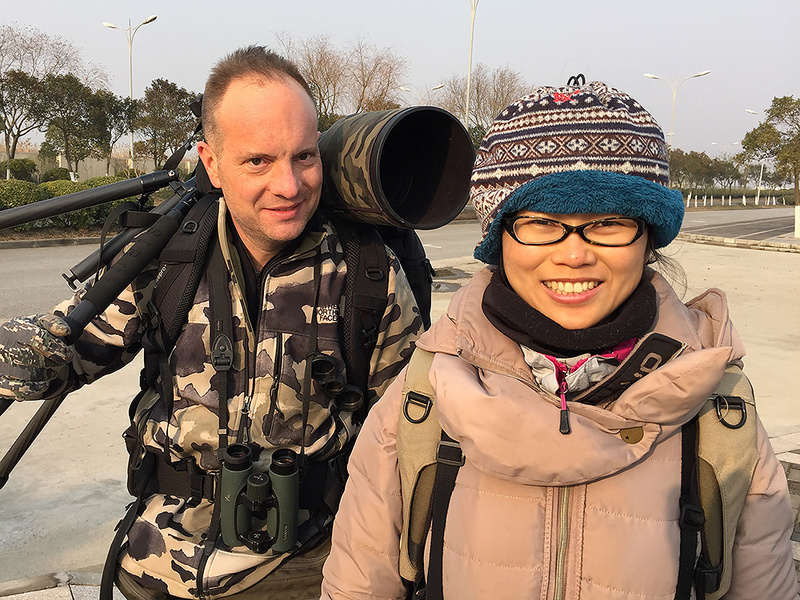 Kai Pflug (L) and Elaine Du finishing up a successful birding day at Nanhui, 5 Feb. 2016. With Kai capably handling the photographic side, my skills in that field were rendered irrelevant; I put on my birdwatcher’s hat and was content. My wife, as is her wont, kept records and did much scanning with the spotting scope. For maximum efficiency, we distributed duties among our trio. Elaine kept records and scanned the ponds with our Swarovski ATX-95 spotting scope. Kai handled photography, lovingly wielding his Nikon D810 and 400 mm F2.8 lens with 2x teleconverter. I served as chief ornithologist and scope-bearer. We walked 19 km each day. 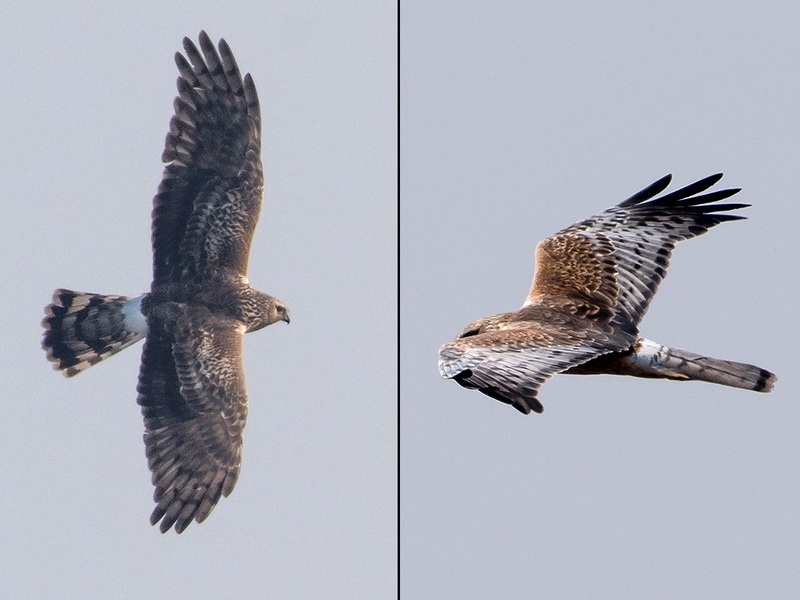 Hen Harrier (L) and Pied Harrier, Nanhui, Monday. Both are adult females. A conspicuous white rump is a feature of both Circus cyaneus and C. melanoleucos. Note however the more evenly banded tail of the former and the more contrasting upperparts of the latter. Both by Kai Pflug. From Puxi we took Metro Line 2 to Longyang Road, where we transferred to Line 16. We exited Line 16 at Dishui Lake station and took a taxi to Microforest 2 (30.926051, 121.970781), where we began birding. On Friday, we walked all the way back to the Dishui Lake station, and on Monday, we took the bus to Dishui Lake station from the stop behind the Magic Parking Lot. Reed Parrotbill were noted both days around Microforest 2. We had Naumann’s Thrush on Friday. 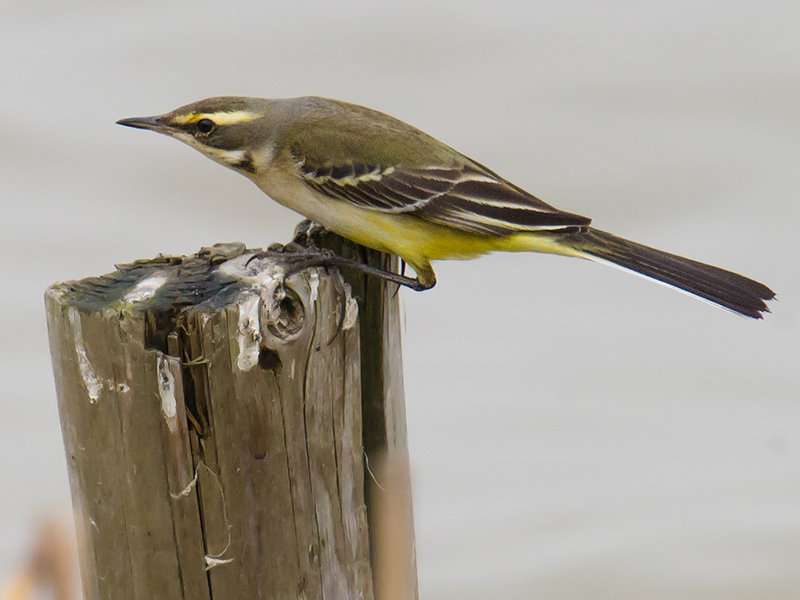 As was the case last year, Eastern Yellow Wagtail (tschutschensis and taivana) have been present in Shanghai in small numbers throughout the winter. 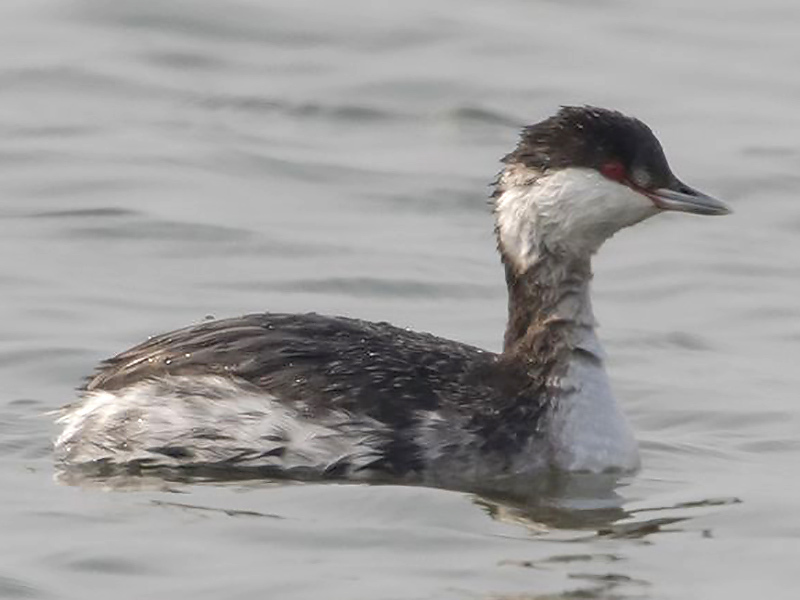 Horned Grebe has had a sustained presence on Dishui Lake for at least the past 60 days. Also known as Slavonian Grebe, Podiceps auritus is thought to be a rare winter visitor to our area, but it may be overlooked. 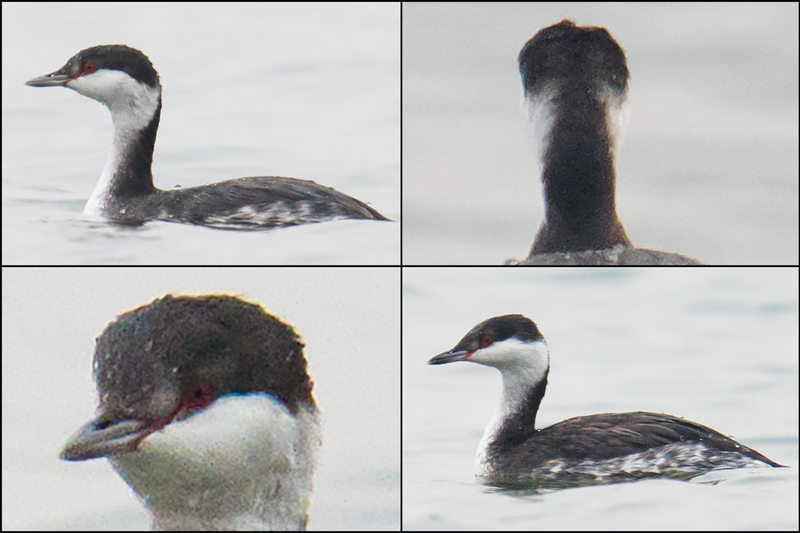 Horned Grebe, 1 of 3 seen on Dishui Lake, Shanghai, 5 Feb. 2016. Small numbers of this species have been noted on Dishui Lake since December 2015. Also known as Slavonian Grebe, Podiceps auritus is a rare winter visitor to the Shanghai region. Photo by Kai Pflug for shanghaibirding.com. 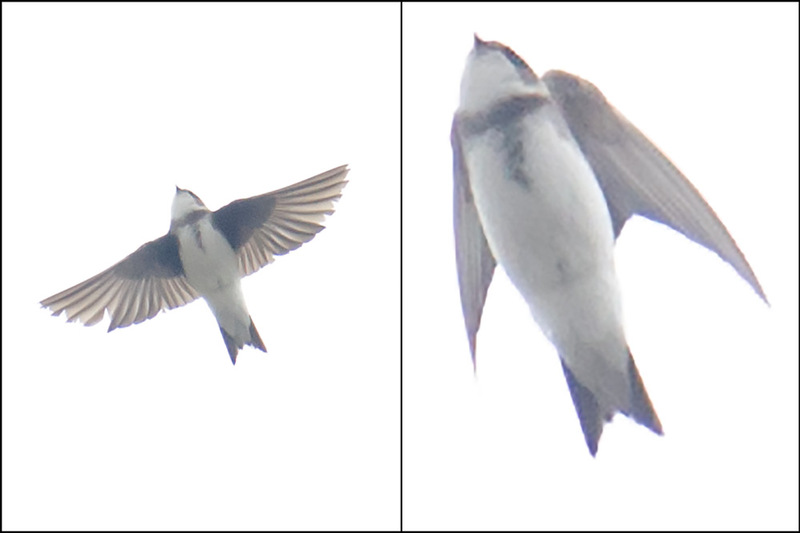 List 1 of 1 for Fri. 5 Feb. 2016 (49 species). Around Pudong Nanhui Dongtan Wetland (Pǔdōng Nánhuì Dōngtān Shīdì [浦东南汇东滩湿地]), Shanghai, China (30.920507, 121.973159). List includes birds found at Dishui Lake (30.908702, 121.945124) and along Shijitang Road. Mostly sunny, hazy; low -2°C, high 9°C. Visibility 10 km. Wind NNW 15 km/h. PM2.5 AQI: 184. Sunrise 06:44, sunset 17:33. FRI 05 FEB 2016 08:15-15:30. Craig Brelsford, Elaine Du, & Kai Pflug. 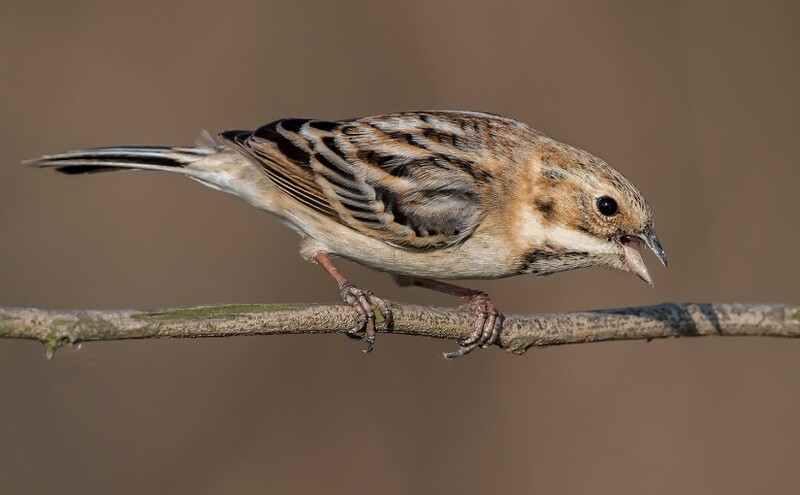 With the polluted Shanghai air acting as a filter, the morning sunlight kisses this Little Bunting ever so softly, helping photographer Kai Pflug achieve this masterful image. List 1 of 1 for Mon. 8 Feb. 2016 (56 species). Around Pudong Nanhui Dongtan Wetland (Pǔdōng Nánhuì Dōngtān Shīdì [浦东南汇东滩湿地]), Shanghai, China (30.920507, 121.973159). List includes birds found at Dishui Lake (30.908702, 121.945124) and along Shijitang Road from Microforest 2 to Magic Parking Lot (30.882784, 121.972782). Sunny; low 2°C, high 14°C. Visibility 10 km. Wind NNW 15 km/h. PM2.5 AQI: 171. Sunrise 06:41, sunset 17:36. MON 08 FEB 2016 08:00-16:00. Craig Brelsford, Elaine Du, & Kai Pflug. 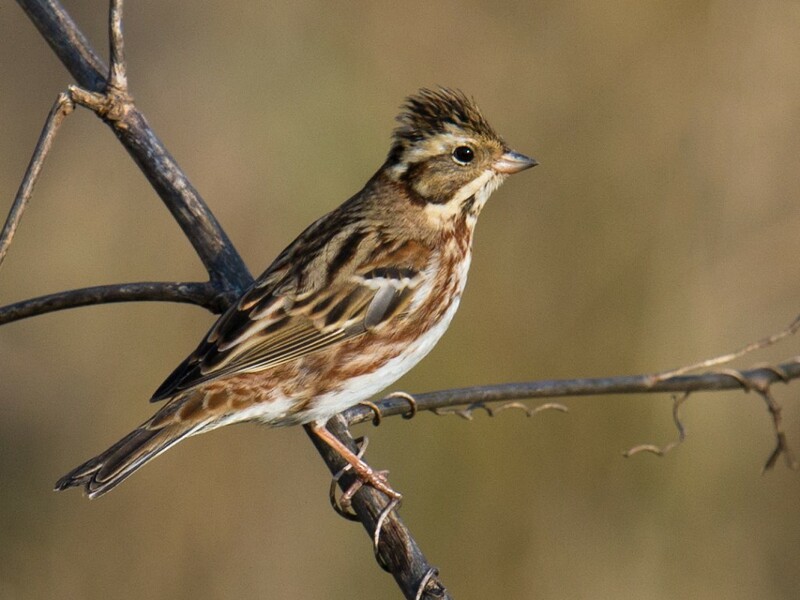 Featured image: Pallas’s Reed Bunting Emberiza pallasi, Microforest 2, Nanhui, 8 Feb. 2016. Photo by Kai Pflug for shanghaibirding.com. The thinness of the upper mandible of this specimen raises the question: Could this be E. p. lydiae? 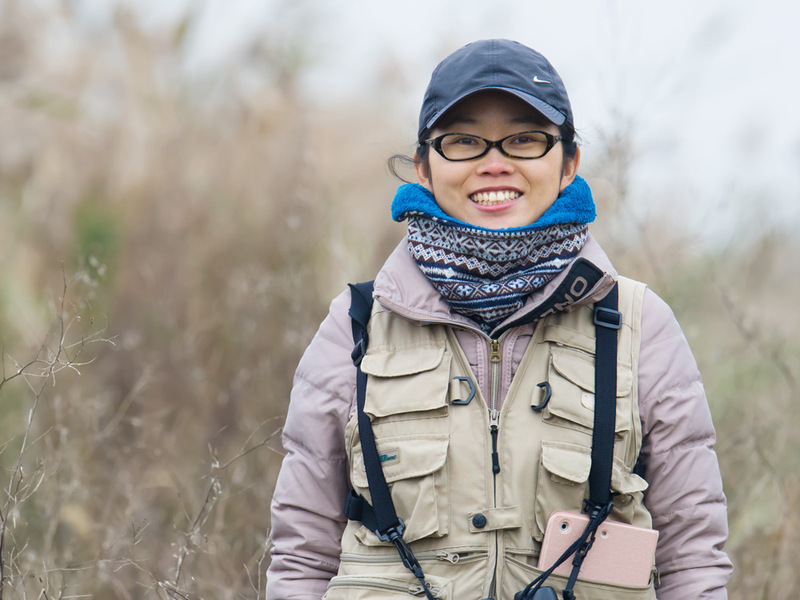 Elaine and I birded Nanhui on foot, noting 43 species. 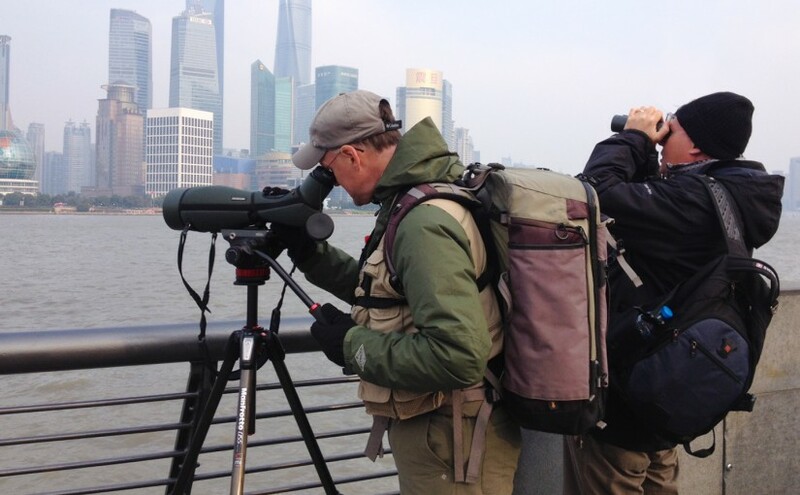 I had my first-ever visual record of Brown-cheeked Rail in Shanghai, and at Dishui Lake we noted Common Goldeneye, 6 Greater Scaup, and 4 Black-necked Grebe. We had an unusual winter record of Eastern Yellow Wagtail (ssp. tschutschensis). 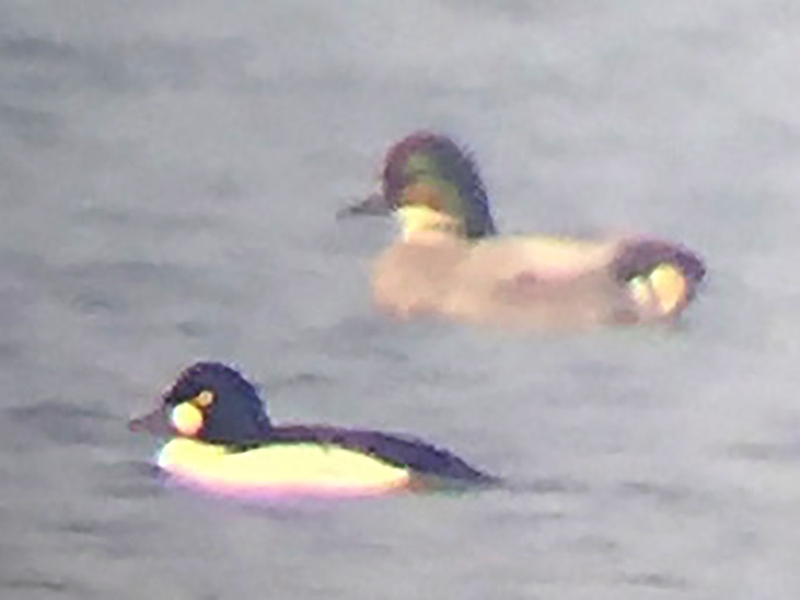 Common Goldeneye with Falcated Duck, Dishui Lake, 16 Jan. 2016. Photo created with iPhone 6 and Swarovski ATX-95 spotting scope mounted on Manfrotto head and carbon-fiber tripod. The Brown-cheeked Rail was at 30.907690, 121.972372. Our discovery of the shy species came about because we were walking, not driving. On a sunny and unusually quiet day along Shijitang Road (the sea-wall road), Elaine and I were walking slowly, noting every sound and movement. Had we been driving, we might have missed the brief, piercing call of the rail. The sound was coming from the reeds at the landward base of the sea wall. As it was time for lunch, and knowing how long rail vigils can take, Elaine and I sat down and ate our sandwiches in the warm sun, watching for movement in the reeds below and recording the calls the rail was intermittently making. Finally, the rail appeared atop the thin drainage canal connecting the wall to the marsh. I got a good enough look at the brownish flanks to affirm that the bird was not the extralimital Water Rail Rallus aquaticus but Brown-cheeked Rail R. indicus. The valuable record was icing on the cake for us, because Elaine’s and my main goal today was not to acquire lifers but to get outside and exercise. If good birds appeared, we said, then fine, but nothing was more important to us than casting away the cooped-up feeling we get living in our apartment in the center city. We wanted sunshine, broad horizons, and the relatively clean air of Nanhui, and this time, for the first time, we wanted to bird Nanhui on foot. 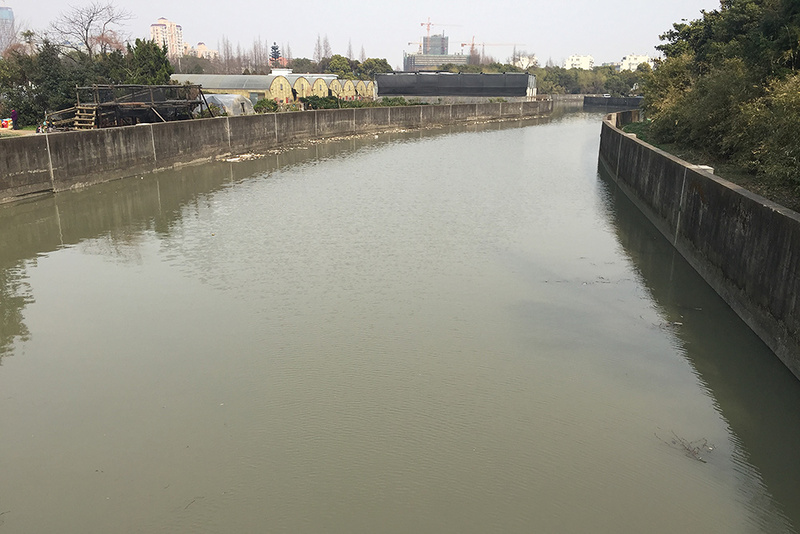 We were able to do Nanhui without a car because of the recent opening of Metro Line 16, whose south terminus is at Dishui Lake. We needed only 90 minutes to go from our apartment near Zhongshan Park to Dishui Lake, taking Line 2 to Longyang Road and transferring to Line 16. After a quick taxi ride, by 08:15 we were at our favorite Dishui Lake viewpoint (30.908702, 121.945124). Having noted in addition to the aforementioned birds 350 Falcated Duck, 4 Tufted Duck, 1 of today’s 2 Richard’s Pipit, and surprisingly 0 Common Pochard, Elaine and I walked toward the coast. I had no camera with me, only my spotting scope and binoculars. Eastern Yellow Wagtail Motacilla tschutschensis tschutschensis, an unusual winter record for Shanghai. 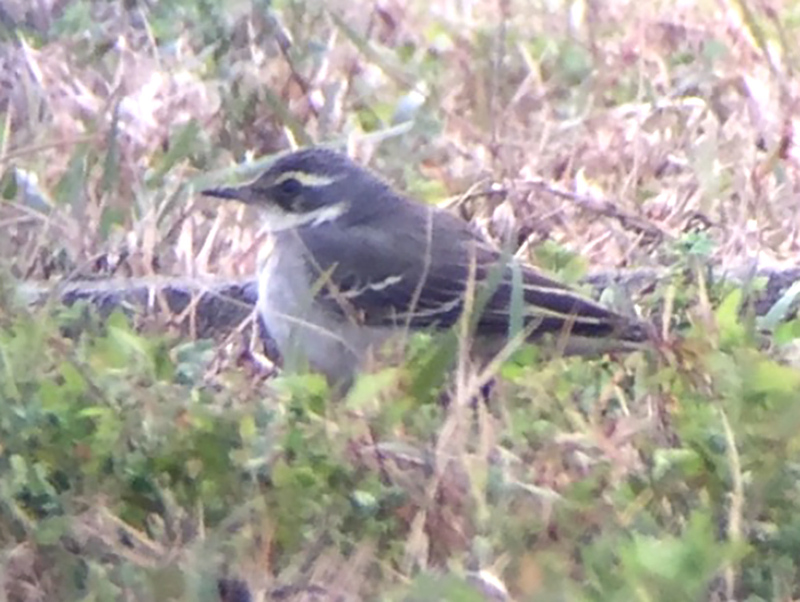 At the sea wall, we turned north, finding many Buff-bellied Pipit, White Wagtail, and the misplaced Eastern Yellow Wagtail. We ID’d our 2 Pied Harrier on the basis of the combination of brown back, greyish secondaries, and white rump of both birds, which were together. We heard two more rails but in even thicker cover than the first; we did not wait around for a visual to nail the ID, but we presume that they too were Brown-cheeked. Walking on an unpaved road into the reeds, we startled Common Snipe and Eurasian Teal. We watched Reed Parrotbill pry open the reed stems, making a crunchy sound. One snipe, a loner, made only a quick, low flight before dropping stonelike and silently into the reeds. There was no “sneeze” at takeoff, unlike Common Snipe, and I saw no white trailing edge to the wing (which is not to say it was not there). The snipe appeared smaller than Common. Because of the angle of the snipe’s head as it dropped, I could not see the bill. Was it Jack Snipe? I do not know, but I urge local birders not to chalk up every snipe they see to Common but to take a good, hard look. We u-turned and walked south, reaching the bus stop behind the Magic Parking Lot at the Holiday Inn. It was 15:20 and we had walked 17 km. We took the bus back to the Dishui Lake Metro Station. The subway ride back to Zhongshan Park was just as smooth as the ride out. 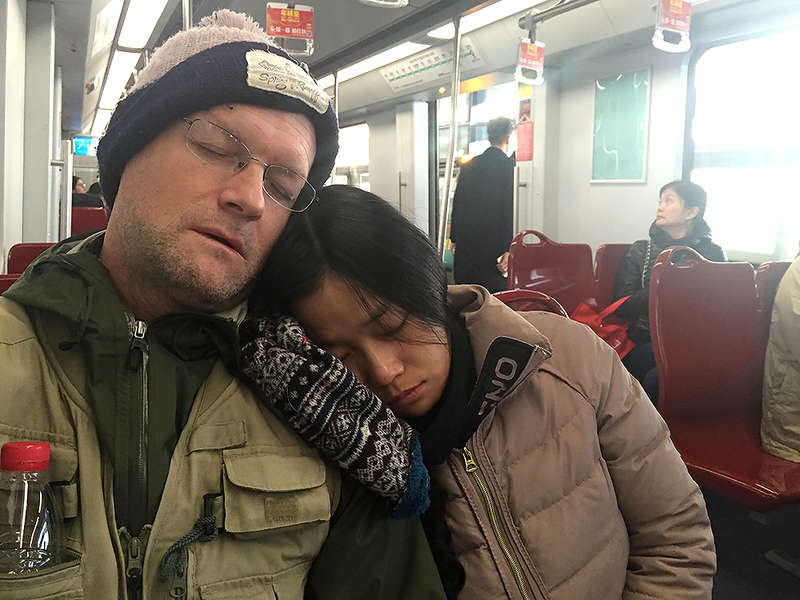 Craig Brelsford and Elaine Du sleeping on Line 16. It’s a long ride out to Dishui Lake, but birders are virtually guaranteed a seat on Line 16. That’s because the stations one uses to access and exit Line 16 (Dishui Lake and Longyang Road) are the terminuses of Line 16. Note here that, even though I was fast asleep, I nonetheless retained the presence of mind to photographically record this moment for you. List 1 of 1 for Sat. 16 Jan. 2016 (43 species). Around Pudong Nanhui Dongtan Wetland (Pǔdōng Nánhuì Dōngtān Shīdì [浦东南汇东滩湿地]), Shanghai, China (30.920507, 121.973159). List includes birds found at Dishui Lake (30.908702, 121.945124). Thick morning haze then mostly sunny skies; low 0°C, high 10°C. Visibility 0-10 km. Wind E 6 km/h. PM2.5 AQI: 189 (Shanghai). Sunrise 06:53, sunset 17:15. SAT 16 JAN 2016 08:15-15:10. Craig Brelsford & Elaine Du. 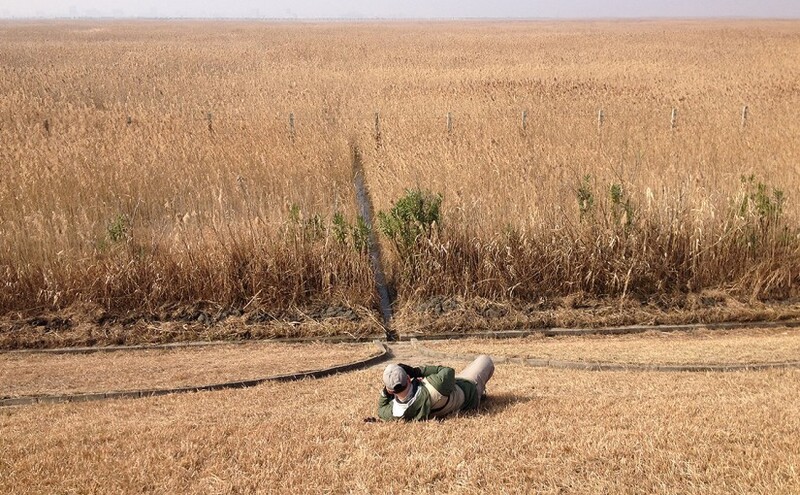 Featured image: Craig Brelsford viewing Brown-cheeked Rail in a drainage ditch at Nanhui, Shanghai, China, Sat. 16 Jan. 2016. Photo by Elaine Du. On Saturday 12 Dec., birding once again with the Dream Team, Elaine and I noted 69 species at Lesser Yangshan and Nanhui. We found Horned Grebe, Black-necked Grebe, and Greater Scaup at Dishui Lake, we noted 600 Common Shelduck off the coast at Nanhui, and we added Tundra Swan, Red-breasted Merganser, Common Goldeneye, Brown-eared Bulbul, and White-rumped Munia to our Shanghai-area autumn-winter list. 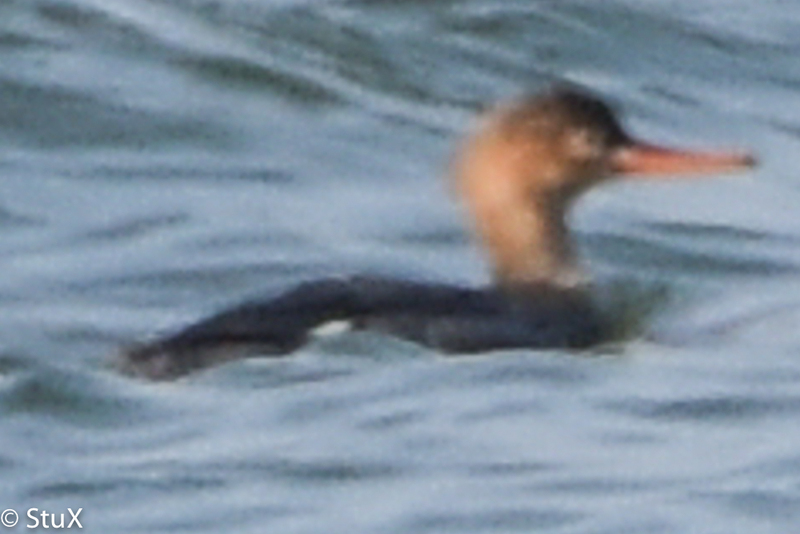 This long-distance image shows the straighter, unhooked bill of Red-breasted Merganser. Common Merganser by contrast shows a hooked bill. © 2015 by Stephan Popp & Xueping Popp. Lesser Yangshan has been thin lately, but it was with past December views of Brown-eared Bulbul in mind that we made the 25-km trek across the Donghai Bridge to the little island. Sure enough, we quickly found a single Brown-eared Bulbul, a scarce winter visitor in the Shanghai area. The bird was in Garbage Dump Gully and was flying excitedly from tree to tree. We guessed it had just arrived. Michael was pleased with his lifer. In the trees in the courtyard we found a pair of Japanese White-eye. Finding little else of interest, we left Lesser Yangshan after less than an hour. Our first stop at Nanhui was an overgrown field near Dishui Lake. Here we found a strong mix of buntings, among them Rustic Bunting and Yellow-browed Bunting. 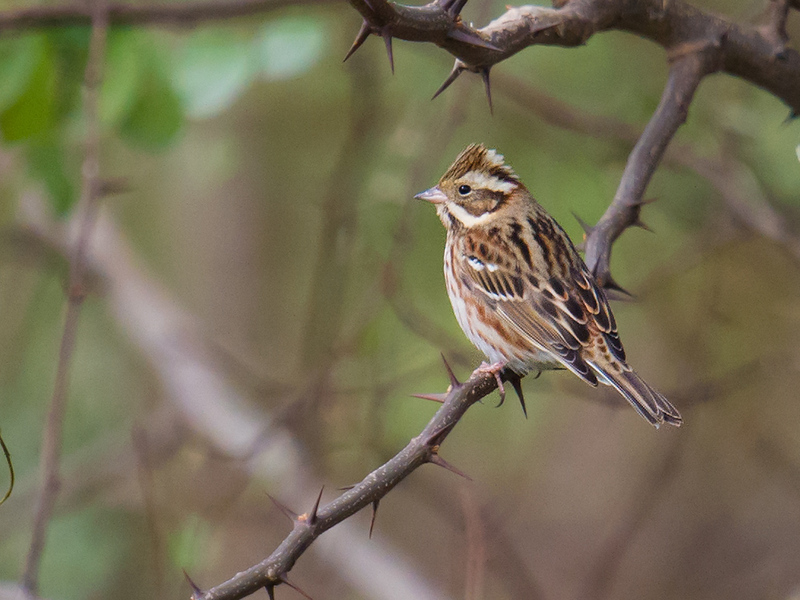 Rustic Bunting Emberiza rustica breeds across northern Eurasia, from Sweden to the Chukotka Peninsula. 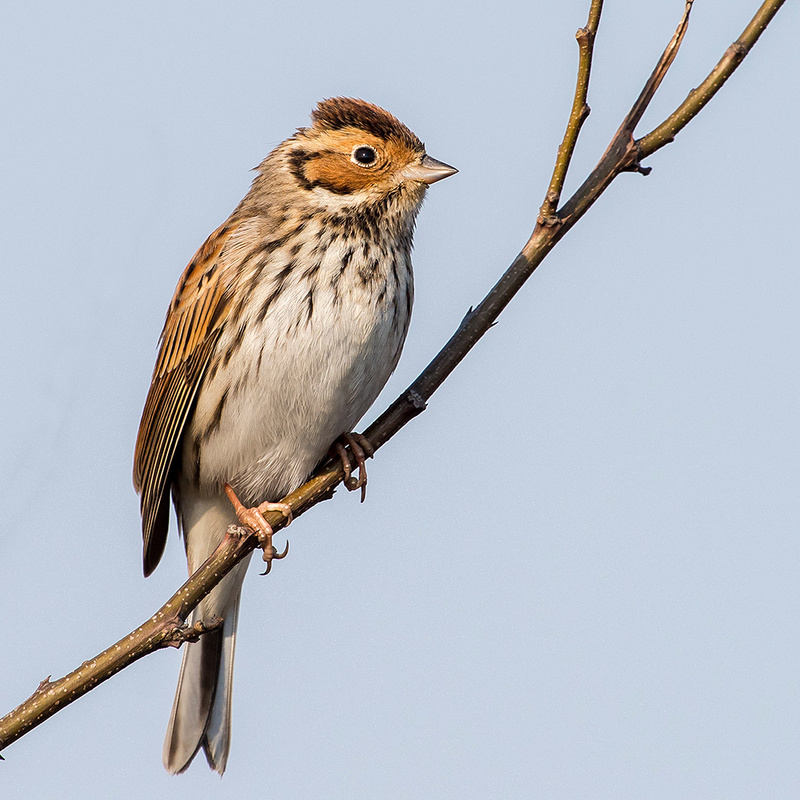 It’s an uncommon passage migrant and winter visitor in the Shanghai region. At Dishui Lake, the first bird I laid eyes on through the scope was the Red-breasted Merganser. Xueping snapped up record shots of the distant duck. The straight bill of our Red-breasted distinguishes it from the hooked bill of Common Merganser. Tufted Duck were the most numerous diving duck, and Falcated Duck the most numerous dabbler. 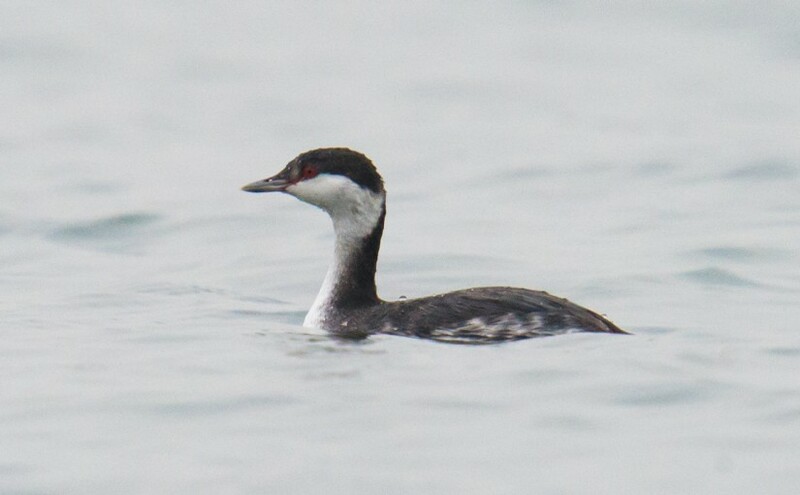 The Horned Grebe, also known as Slavonian Grebe, was in the same northeastern corner of Dishui where Elaine and I found 3 Horned Grebe six days ago. 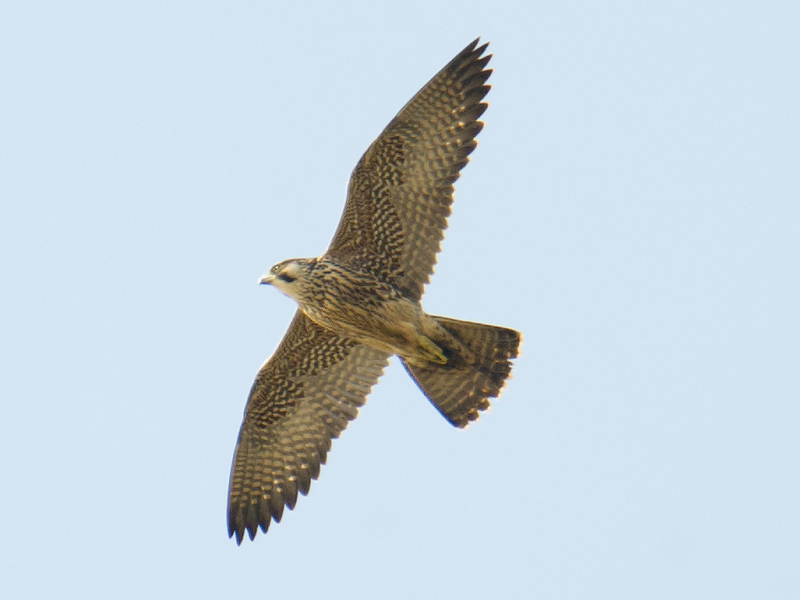 Peregrine Falcon soaring above Magic Parking Lot, Nanhui. This specimen is a juvenile, told from adult by streaked rather than cross-barred breast and belly. Note stockier, more powerful build of Peregrine as compared to other falcons. A quick stop at the Magic Parking Lot once again revealed late Barn Swallow. Absent from Dishui Lake, they were present in their dozens over the smaller pond behind the Holiday Inn. For the past three weeks, we have noted Barn Swallow there and nowhere else. A Peregrine Falcon soared over the carpark. The problem with the sea-wall road at Nanhui is that another wall runs along the road, blocking one’s view of the mudflats below. Barred thereby from scanning as one drives, one is forced to make periodic stops and get out of the car. During one of these stops, we found the impressive flock of Common Shelduck. 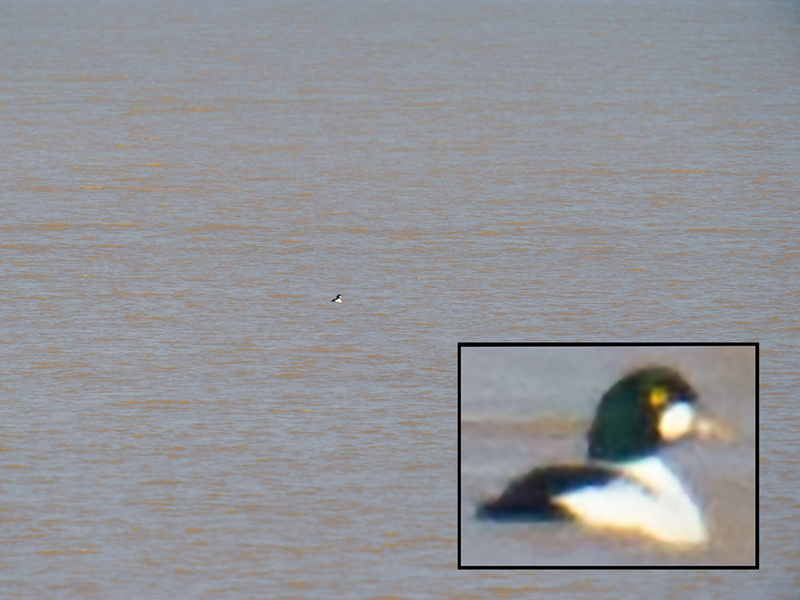 A much luckier view was that of the Common Goldeneye. A random stop produced a single white spot in the muddy sea far out. The scope brought him in just before he took another long dive. Common Goldeneye alone on the muddy sea off coast of Nanhui. A random stop along the sea wall road produced this lucky record. Goldeneyes are divers, and if this adult male had been in a dive during our quick stop, we surely would have missed it. Common Goldeneye breeds throughout northern Eurasia and North America. At Nanhui we ran into Hé Xīn (何鑫). He alerted us to the presence of Tundra Swan, and he told us he had seen an Oriental Stork. He also found Swan Goose. We were able to locate the Tundra Swan but missed the stork and Swan Goose. The Dream Team consists of veteran birder Michael Grunwell, husband-and-wife team Stephan Popp and Xueping Popp, my wife Elaine Du, and me. With the new additions, Elaine’s and my Shanghai autumn-winter list now contains 260 species. We started the list on 11 Sept. 2015. Lesser Yangshan Island (Xiǎo Yángshān [小洋山]), island in Hangzhou Bay, Zhejiang, China. List includes birds noted at Garbage Dump Gully (30.641565, 122.062836), Garbage Dump Coastal Plain (30.638860, 122.060089), & Temple Mount (30.639866, 122.048327). Mostly cloudy. Winds NNE 11 km/h. Visibility 10 km. Sunrise 06:44, sunset 16:52. High 11°C. SAT 12 DEC 2015 07:00-07:50. Craig Brelsford, Elaine Du, Michael Grunwell, Stephan Popp, & Xueping Popp. Around Pudong Nanhui Dongtan Wetland (Pǔdōng Nánhuì Dōngtān Shīdì [浦东南汇东滩湿地]), Shanghai, China (30.920507, 121.973159); list includes birds found at Magic Parking Lot (30.882784, 121.972782), Magic GPS Point (30.880540, 121.964572), the empty blue-roofed building & nearby microforests (30.961368, 121.952136), and Dishui Lake (30.908702, 121.945124). Mostly cloudy. Winds NNE 11 km/h. Visibility 10 km. Sunrise 06:44, sunset 16:52. High 11°C. SAT 12 DEC 2015 08:30-13:40. Craig Brelsford, Elaine Du, Michael Grunwell, Stephan Popp, & Xueping Popp. 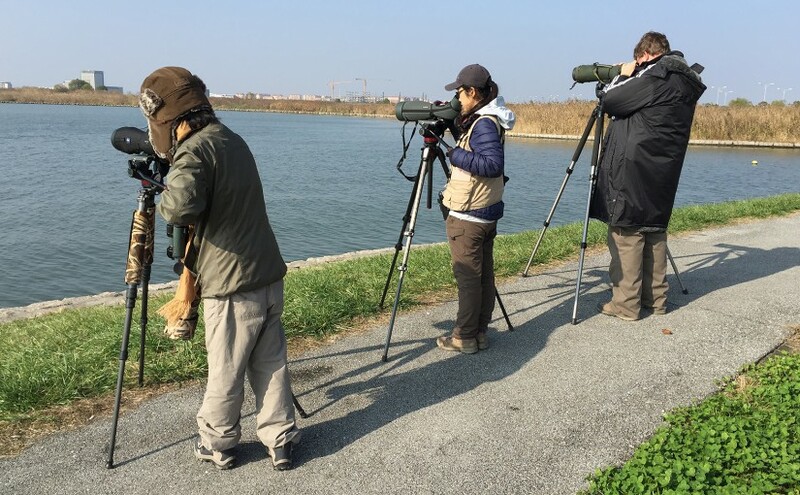 Featured image: Xueping Popp (L), Elaine Du, and Michael Grunwell (R) view Horned Grebe at Dishui Lake, Nanhui, Shanghai, 12 Dec. 2015. At Dongtai on Sat. 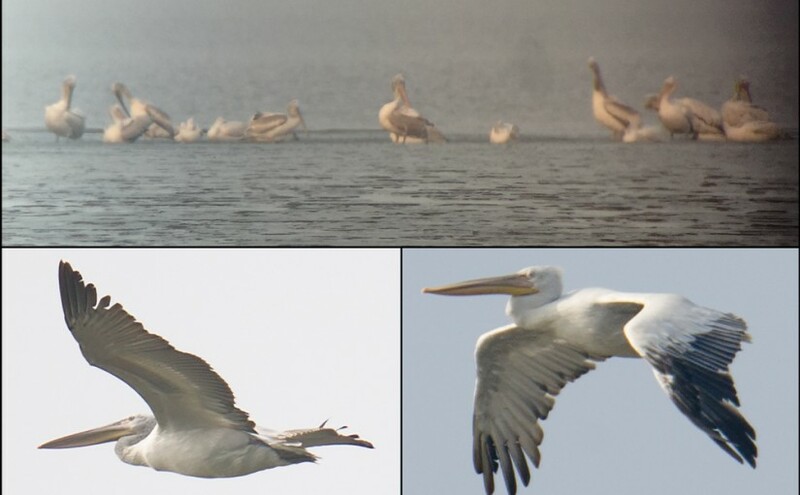 14 Nov. 2015, the Dream Team noted 80 Dalmatian Pelican. Black-faced Spoonbill once again were present at this great, unprotected wetland. Among the species appearing in considerable numbers were Common Pochard (300), Eurasian Oystercatcher (150), Pied Avocet (300), Grey Plover (2000), Kentish Plover (300), Eurasian Curlew (1200), Dunlin (800), and Saunders’s Gull (250). We noted Falcated Duck and Tufted Duck. Michael Grunwell and husband-and-wife team Stephan and Xueping Popp left Shanghai at 03:30 and arrived at Yancheng at 06:30. Elaine and I met them on the Surf ‘n’ Turf Trail at Dongtai. Approaching from the south, we got a call from an excited Michael, who said, “Get up here! There’s a flock of 80 Dalmatian Pelican right in front of us!” Elaine and I arrived in time. In one eyeful I was seeing more pelicans than I had seen in my previous eight years in China. We noted once again that the SE corner of the sea wall is the last place in the area to be covered with the incoming tide. We were there as the tide moved in (it never reached the wall here), and noted the impressive shorebird numbers listed above. The light was fading by 16:30. Elaine and I bade farewell to the trio and returned to our hotel. Michael, Stephan, and Xueping returned to Shanghai. Great Dongtai Surf ‘n’ Turf Birding Trail, a 40-km loop on coast of Dongtai (Dōngtái [东台]), a county-level city in Jiangsu, China. 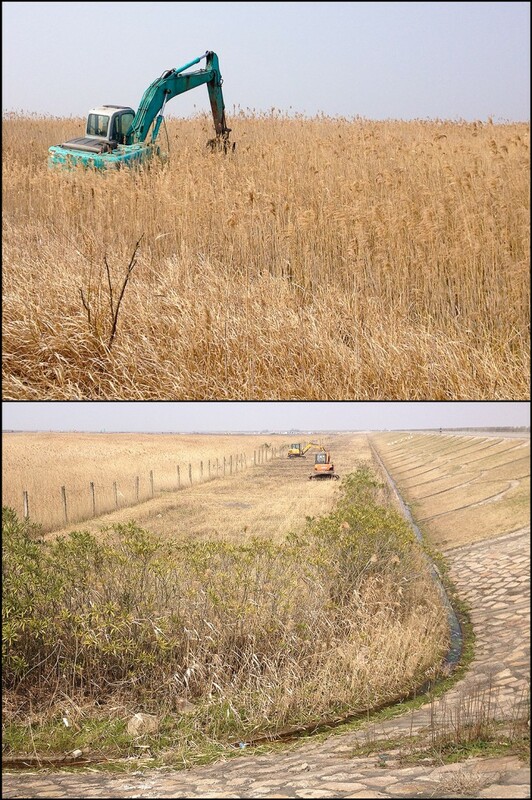 Important points on Trail are N entrance to new sea-wall road on Dongtai Levee Road (Dōngtái Hǎidī [东台海堤], 32.868218, 120.912340), T-junction on Dongtai Levee Road (32.855576, 120.896557), viewing area on W side of lagoons (32.850988, 120.958103), S entrance to new sea-wall road on Dongtai Levee Road (32.759765, 120.928722), SE corner of sea wall (32.759499, 120.962893), & NE corner of sea wall (32.872444, 120.951522). Foggy & hazy in morning, turning clearer & sunny in afternoon. Wind WNW 11 km/h. High 16°C. Sunrise 06:23, sunset 16:57. SAT 14 NOV 2015 10:05-16:30. Featured image: Dalmatian Pelican at Dongtai, Jiangsu, China, 14 Nov. 2015. Listed as Vulnerable by IUCN, Pelecanus crispus breeds from Serbia to Mongolia, with Mongolian breeders wintering along the China coast. Populations in the western parts of its range are stable and even increasing, but the populations in Mongolia and China are in dire trouble.